Lately, I’ve been thinking a lot about what I want my life to look like, and how I want to spend my time. Do I always want to be working? Nope. Do I want time to give back to my community? Yes. In the past, a lot of my time has been devoted to earning money for my family and to raising my son. Now, with my freelance business doing reasonably well, and with my son almost to middle school, I have a little more free time. And I’ve been thinking about what I want to do with that free time. Basically, the way I want to use my free time is divided into two categories: Self-improvement and giving back. One of the best investments you can make is in yourself. I want to be able to grow my own capabilities, and improve myself as a person. My husband has been trying to get me to take guitar lessons again since I gave them up three years ago to make time for work. But it’s not just musical development I’m interested in. I’d also like to take a few classes at the university, and maybe work on expanding my mind in other ways. Not only is self-improvement fulfilling, but I also think that it would help me improve as a wife, mother and business owner. The skills and discipline acquired and practiced through the activities I’m drawn to would translate into my business as well. Plus, I having more things to add to my schedule would probably force me to be more productive during my work time. For years, I’ve wished to be more involved in my community. I haven’t felt like the time was available, though. This year, I’m volunteering on the PTA board at my son’s school, and I’m getting involved in the community council. Additionally, I am sitting on the board for a local arts event. Helping in these capacities are great because they help improve the community, and I feel good giving my time. I’d like to find time to volunteer at the food pantry, adding my time and effort to the regular donations I send, but I’m not sure I’m quite ready for that yet. I don’t know that I have that much time. While I’m excited about these newfound projects, I do need to be careful about over-scheduling. One of the pitfalls of modern society is the tendency to be out and doing for the sake of being busy. I want to stay carefully balanced. I don’t want my activities to cut into quality time with my husband and son, and I don’t want to end up burned out and stressed. This means that I need to prioritize. What is most important to me right now? At this stage of my life, where do I want to spend my time? I like volunteering with PTA and with community council because it puts me in my son’s school, and I can help improve education, and it gives me a reason to spend more time with my son. I like the idea of self-improvement because it is something I can do for me. We all need to take time for ourselves. It’s a way to connect with yourself and to grow as a person. Plus, when you fill up your own well, you are able to turn and help others later. Being happy with myself, and confident in myself, makes for a better relationship with my husband. While we lean on each other for many things, the reality is that I can’t expect him to do everything for me. I need to do some things for myself, and be my own person. 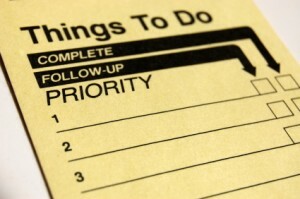 So, since I can’t do everything — and I wouldn’t want to — I need to prioritize. This means that I’ve had to cut back a little bit on work and switched out some of my clients, and it also means that sometimes I say no to demands on my time. But it also means that the things I do participate in receive more of my attention, and that there is the potential for me to give more to these activities. What do you think? How do you spend your time? How do you keep from becoming too busy? You are right that avoiding over-scheduling is very important. I would add that taking time for thinking about your life is important. It helps to think about your priority, everything you are doing. I find it helpful to cut in the “useless” (in regards to life goal) and to try to think out of the box on ongoing issues. I’ve been thinking a lot about this lately. Investing in myself should be more of a priority, and not taking on too much. I need to learn to spend money on things that will make me a better, happier and more confident person. Because my future-self won’t appreciate the extra savings if I don’t feel good about myself. I agree! I’m a big fan of purposeful spending. I don’t mind spending my money if it’s accomplishing something that’s important to me. Anything one can do to help their community while developing new skills is a huge plus in the maturity and growth department. I learned long ago that one’s time is precious and I’ve tried to follow my own path in work and play. I have also learned that getting some valuable ME time is an important aspect of being a balanced, healthy and happy individual! Take care and the best of luck to whatever you choose to do. Thanks for the encouraging and kind words! I agree that time is so valuable. It’s more valuable than money, since time is irreplaceable. I think it’s great that you are doing what you love, and that you are able to get in some of that ME time. I think we are too quick to underestimate how important that is. Miranda, thanks for this article. For me it is very timely: I was just thinking today, and telling a colleague and a friend, that the paradigm seems to have change. It used to be that we could aim to do well all we had to do. Now, the level of pressure and conflicting demands on our time has reached such levels that the best we could do is to be very good in selecting what to do well. Here I have a problem I want to get busy on :). That’s a good point. There’s so much vying for our attention; we need to decide what’s most important and then focus on those things for excellence.